Whatever Matthew Whitaker was hoping to accomplish when he agreed to illegally become Donald Trump’s Acting Attorney General, it’s all over now. Whitaker still technically holds the title, though it’s clear that Mueller and Rosenstein have scared him into not interfering with the Trump-Russia probe. But now Whitaker just got rung up on his worst fear – and his life is about to be altered drastically. 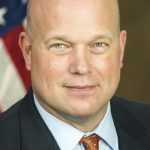 The House Judiciary Committee, now under the control of the Democrats, has announced that Matthew Whitaker is its very first investigative target. Whitaker has been trying to hide behind the Department of Justice and Donald Trump’s government shutdown in order to avoid testifying, but nothing works that way, and so the Democrats will subpoena him if he doesn’t show up, according to Politico. So why is this so horrible for him? Congressional subpoenas are legally binding. If Matthew Whitaker doesn’t show up, he’ll be held in contempt and arrested. So he can either choose to go that route, or he can show up and answer questions in front of the television cameras. During his testimony he’ll have to confess to the obstruction crimes he’s witnessed Donald Trump committing, and he’ll have to answer questions about his own patent scam endeavors. While the House Judiciary Committee doesn’t directly bring criminal charges based on testimony, it can (and will) make a criminal referral to ensure that Matthew Whitaker gets rung up on all of the crimes he’s committed, both for Trump, and for himself. Whitaker had a short window of time to resign and disappear before the Democrats decided to destroy him, but that window has closed. Whitaker is the committee’s Target #1, and his life is now over.